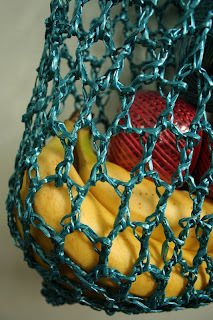 What's a crafter to do with polypropylene string? I can't remember the title of the book that I saw this idea in, but I picked up some string to make up my own pattern. I started from the bottom up, finishing with the straps. I don't like to get too fancy with my crocheting so it's all chains, single and double crochets. I really like how this bag turned out, and who knew polypropylene string came in pretty colors! 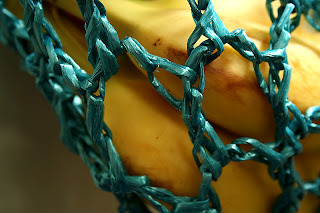 I have this blue shown here as well as red which you can see in the bag, just above the bananas. Bag is made from bottom up in the round. -Single crochet all the way down one side of chain and back up the other side and slip stitch to join to work in the round. 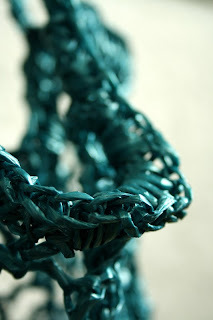 -Chain 2 to begin round and work single crochet for 2 rounds. 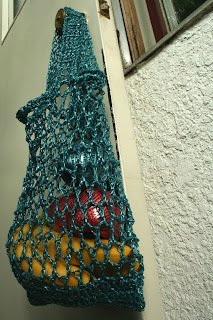 -Chain 3 to begin round and work double crochet for 2 rounds. -Chain 5 to begin round, (*skip 1 space, double crochet into next space, chain 3*) repeat (*to*) until end of round, slip stitch into 3rd chain from beginning of round to join. -Slip stitch into next 2 chains, chain 5 to begin round, (*double crochet into next space (between double crochets), chain 3*) repeat (*to*) until end of round, slip stitch into 3rd chain from beginning of round to join. Do 11 rounds like this. -Work single crochet around both single crochet rounds together to create a bigger, sturdier round for the bags edge. -Slip stitch to about 1 1/2 inches in from side. -Chain 3, double crochet into next 4 spaces. (5 double crochet-wide strap.) Turn. -Work until strap reaches desired length. I made mine 19 inches. -Hold strap end to 1 1/2 inches in from opposite side and single crochet together to join. -Slip stitch around to other side until about 1 1/2 inches in from side. Repeat strap directions for second strap. I don't know that hook gauge needs to be too specific. I used a 5mm and my bag ended up measuring 14" top to bottom, 10" across at the bottom and 14" across at the top. Straps measure 19". Another thing to note, the single and double crochet at the bottom does not stretch as readily as the loosely chained body of the bag. I like it this way but you could always omit the double crochet section and start right in on the body portion of the pattern. posted by Venus @ 7:59 p.m.
That is so cool! And I had no idea you could get nice colors like that. Where do you get the Polypropylene string? I found the polypropylene string at the dollar store, just by chance. I would also try hardware stores to see if they might carry them. what size hook did you use to make this? i love it! On Strike! It's Sam's Strike!